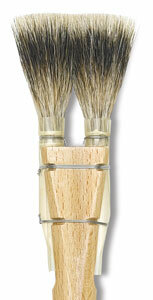 This soft badger hair chiqueter brush features hand-tied quills fixed to a long, flat natural polished handle. It is flat with two square-edged locks. This is a truly unique brush for the discerning artist.